#cubania @RoyalOperaHouse is superb. Great music and amazing dancing and inspired choreography. In spite of the space it felt intimate. Fantastic evening at @CAcostaOfficial's #Cubanía at the @RoyalOperaHouse - want to go to Cuba and learn Cuban dance now! Thank you @CAcostaOfficial that was SUPERB #Cubania @RoyalOperaHouse . Cannot stop smiling & wanted to get up & dance at the end! What did you think of Cubanía? Cubanía runs until 2 August 2015. Tickets are still available. What an amazingly talented company. Well done to all involved. You just can't get enough of Carlos Acosta! I am 50/50 on this.. some aspects were brilliant.. but at times it was more like a cabaret and less inspiring.. Went to see Cubania on Friday night - very boring - really don't understand why the ROH put this on - very third rate - I could not wait to go -would have left early on but had paid a lot for my tickets. Carlos Acosta super dancer but as a choreographer weird. I have to admit, I took some friends to see todays performance and I had said to them that Carlos Acosta is just brilliant. So at the interval after the contemporary performance I asked how they all enjoy it and there was a look of disappointment. Then came this amazing show after the interval and finally I was vindicated. Carlos Acosta is truly brilliant. BRILLIANT. They were just blown away. The energy, the movement the whole performance, what a night. Thank you to all the team; the dancers, the musicians, even the lighting engineers who managed to bring that Cuban spirit to Covent Garden. I loved it. I got the sense the first half was a challenge for some audience members - but I also felt that there were a good number of people on the audience who were not RoH regulars , proving that Acosta's reach is already significantly beyond the box of classical repertoire. The first piece (Derembe?) was very powerful. Anyone who has ever heard or witnessed an abusive symbiotic relationship will feel this piece keenly. Acosta can do it all. I look forward to his transition more then ever. Just as Sylvie Guillem hangs up her shoes, we need him more than ever. And can I just say -Alexander Verona?!! Than man is a joy to watch. A beautiful performance of Cubania, I thoroughly enjoyed it. My only down side was sitting on front row A1. Although I didn't expected to have frontal viewing I did expect to be sat in front of what appeared to be a rigging of some sort. If you can imagine you are sat at a lovely dinner table but the table comes up to your chin...whilst you can see it is awful. Spending £67's on a ticket and to be sat with such a contraption in front of me spoilt it a little for me. Sorry to hear you were disappointed with the view from the seat - we'll pass your feedback on to the Box Office. Thanks and glad you enjoyed the performance itself. I meant I didn't expect to be sat in front of this rigging and not that I did expect. This was my first time at the Royal Opera. I saw "Cubania" twice last year, then again on Friday night and Sunday evening. Each time I have felt a little underwhelmed by the first half, mainly because I prefer classical ballet. In response to Natalie's comment above, please note that Carlos was not the choreographer of those pieces! The second half, however, is always hugely enjoyable! 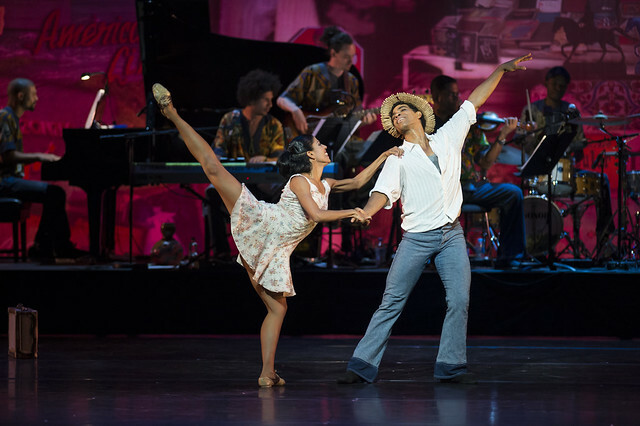 The original stage production of "Tocororo" over 10 years ago broke box office records at Sadlers Wells, and it would be great to see it return in its full original form, where Carlos's nephew Yonah Acosta (now a Principal dancer with English National Ballet) danced the role of the young Carlos on this semi-autobiographical tale. For those looking for a more classical ballet performance by Carlos, I was delighted to find from the program that we are able to see "Carlos Acosta's Classical Selection" in December at London Coliseum Theatre. Prior to that, Carlos performs in his own new production of "Carmen" as part of a quadruple bill in October/November at the ROH. This he has choreographed, and if his "Don Quixote" for the Royal Ballet is anything to go by, I'm sure we are in for a treat!! Thank you, Carlos, for the privilege of seeing you dance! thoroughly enjoyed the show, could not keep my feet still during the second half. Dynamic and upraising, totally understood the underlying meanings excellent and recommended. Sorry - I didn't read the original info properly. Just the title 'Cubania', Cuban Ballet Co, Acosta/Yanowsky was enough to book our usual expensive seats. How did I miss the word 'contemporary'? It was awful. Clearly all of the dancers are all superb dancers - but, they manage with three basic movements just repeated endlessly, 'Flux' being the worst. Can't beat pointed toes and heart-rending tunes. Came home and watched my Manon and R & J to get over my loss of £180. Incidentally, many people around us didn't applaud. Only Zenaida saved the day - just. dear ROH, we love coming to ROH performances with my husband and always found it amazing, but this one was so disappointing that we even could bear it for long and left before end, not high standards, really surprised with low quality, several days before Cuban music was far better represented by Buena Vista Social Club! It was enormous fun. The first half serious post-modern ballet, the second contemporary Cuban. Who could ask for more?